How Do Prepayments Create Mortgage Interest Savings? Enter the annual percentage rate (APR) of the home loan without the percent sign (for 6.5%, enter 6.5). Enter the number of monthly house payments you have already made. If you have not made any payments, leave blank or enter a zero. Enter the monthly amount you can afford to add to your existing payment to prepay your mortgage, without the dollar sign. Enter the number of months or years you will continue to add the prepayment amount to the existing payment. Enter the number of years you plan to stay in your current home. The mortgage savings calculator will calculate mortgage prepayment savings for the entered number of years, or until the mortgage is paid off -- whichever is sooner. Based on your entries, this is how much you still owe (principal balance) on your mortgage after deducting all of the principal payments you have already made. Based on your entries, this is the amount of your current monthly principal and interest (PI) payment. This does not include property tax or insurance payments. If this result does not closely match your actual payment, please check that you have entered the correct beginning balance, term, interest rate, and number of payments made. Based on your entries, this is your current monthly payment plus the prepayment amount you entered in the top section of the mortgage savings calculator. Based on your entries, this is how much interest you will save if you add the prepayment amount for the number of months/years you entered, and if you stay in the home for the entered number of years. Not planning to stay in your current home until the mortgage is paid off? Want to be able to afford a nicer next home? If you answered "Yes" to both of those questions, then you've come to the right place. This mid-term extra payment saving calculator will calculate the interest you will save if you add a prepayment amount to any number of your future mortgage payments. In turn, you can then use the additional equity and prepayment interest savings to purchase a nicer next home! As pointed out by the insightful visitor who requested the mortgage savings calculator, if you only plan to stay in your current home for 8-10 years, then it doesn't make much sense to calculate prepayment savings over the life of the home loan. So, unlike most mortgage prepayment calculators, this specific mortgage prepayment calculator is designed to calculate prepayment savings based on the number of years you plan to stay in your current home. If you would like to calculate the prepayment savings from now until the mortgage is completely paid off, please use the Prepay Mortgage Calculator instead -- which includes a list of things you should consider before prepaying your mortgage. 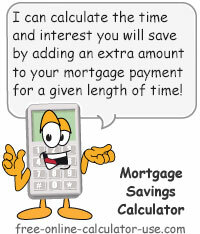 Or, if you would like to calculate the savings for a combination of one-time, monthly, and annual prepayments, please visit the Extra Payment Mortgage Calculator. Enter the original mortgage principal amount. Enter the original loan term in number of years (whole years only). Enter the number of mortgage payments you have already made. Enter the number of months or years you plan to make monthly prepayments. Enter the number of years you plan to stay in your current home. Click the "Calculate Prepayment Savings" button. How prepayments create savings, and how to make prepayments on your next home. When you take out a loan to purchase a home, the monthly payment is based on the number of years you plan to take to repay the loan. Each month during the life of the repayment, the bank calculates the interest portion of each payment on the total balance of the loan. The interest is then subtracted from the payment -- leaving the amount that is used to reduce how much you owe (principal portion). You will have lowered the amount you will be charged interest on for every single month of your remaining repayment term! This is because each time the bank goes to calculate interest, the amount you will be charged interest on will be lower than what the original payment amount was based on. In other words, when you add an amount to your current prescribed payment, you haven't just created mortgage interest savings on your next payment, but you have also created mortgage interest savings for every month for the rest of the repayment term. And this is true for every time you add a prepayment amount to your existing payment. In fact, even if you only make a single, one-time prepayment, your annual mortgage interest savings will actually grow over time -- because more and more of each payment is being applied to paying off the home loan. Suppose you've been making payments on a $250,000, 6%, 30-year mortgage for the past 3 years, but you only plan to stay in your home for another 5-years. - An additional $12,000 in equity. - $2,000 in interest savings. That's $14,000 you won't have to borrow and pay interest on! But wait, if you have high-interest debts and apply the $200 per month to a rapid debt reduction plan, you may be able to double or triple the $14,000 prepayment on your next home.